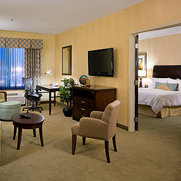 Hotels in Mankato can't beat our world class guest service and prime location near Minnesota State University Mankato. Situated minutes away from River Hills Mall, the area’s largest shopping center, and within a few miles of the Verizon Wireless Center. Fairfield Inn Mankato is conveniently situated near Gustavus Adolphus College and Mount Kato, a great spot for quality skiing, snowboarding, and mountain biking. While you're here be sure to indulge at one of the many nearby Mankato restaurants and bars. Mankato Brewery is a local treasure that travelers are sure to love, and Pub 500 offers guests dozens of unique menu options. Free hot breakfast is provided daily, and property wide free WiFi is sure to keep you connected At the end of a long day relax or go for a swim at our heated indoor pool. If loyalty is as important to you as it is to us, join our Marriott Rewards Loyalty Program and start earning points towards unbeatable perks at our Mankato hotel! Welcome to the Microtel Inn & Suites in Mankato, Minnesota where “Economy with Class” is what you will experience. Nestled into the South Central Minnesota River Valley, Mankato has plenty to offer for all to enjoy: shopping at River Hills Mall, events at the Verizon Wireless Center, MN Vikings Training Camp, Ribfest, All Season Arena and Caswell Park plus much more. Because we know convenience is key, all of our rooms include: free local calls, free long distance in continental U.S., free hi-speed internet as well as a complimentary continental breakfast in the morning. Whether you’re traveling for business or pleasure, one thing you can always count on is a clean, comfortable hotel where you get more for your money. We look forward to welcoming you here at the Microtel Inn & Suites of Mankato. Spend less on your stay so you can have more for your day without losing quality.Catering to no-frills travelers, the brand new Motel 6 Mankato promises a quiet and comfortable stay featuring a contemporary design, large flat screen TVs with an expanded list of channels, guest laundry, business center, free high speed Wi-Fi, 24 hour coffee, truck/trailer parking, a meeting room, plus your pet stays for free; all of this at a great price. We offer specials and discounts for active or veteran military members, local college students and visitors, families and patients of local hospitals, and much more. Located just north of highway 14 we’re conveniently close to many of Mankato area attractions. We’re located less than a mile from several restaurants and a convenient store, less than 2 miles from the River Hills Mall, 3 miles from Mayo Healthcare System and Bethany Lutheran College, 4 miles to the downtown Verizon Event Center, and 5 miles from Mankato State University Mankato. You won’t find a better budget value in town. Call us today to book a room for your next trip to Mankato.